This weekend I tried to help someone on LinuxQuestions.org who asked about the knetworkconf tool from KDEs Control Center. I never bothered about it, as I prefer to do all configuring the 'Slackware-way': editing text files. This way I know what's happening and I am in control. But I understand that this is not for everyone, so this subject pops up once in a while on the forums and I decided to take a look again. I am definitely not a Perl-guru, but browsing through the several files, I discovered it was nothing too complicated. Basically, network configuration hasn't changed much in Slackware over the last several versions so first I just added the newer version numbers to all files where they were checked. Posting the first patch file on LinuxQuestions.org a fellow forum member (thanks Woodsman!) 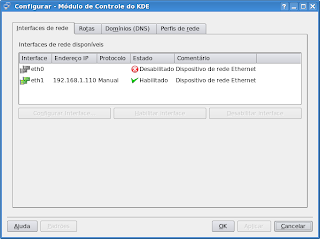 discovered that the KDE tool did not show the configured domain correctly. This actually was a bug in the tool, not my patch, but I managed to solve it. After some more testing I discovered that every time I saved any changes with knetworkconf, my Samba server stopped working and was even disabled. This turned out to be another silly bug in knetworkconf, where they forgot to use a variable that holds the current status of Samba. I posted all patches on the forum and Pat has already included them in the -current branch (see the changelog). I also sent the patches upstream to the fellows at KDE, so hopefully it makes it into the next versions there as well. Be careful with the longer lines! but when I highlighted and pasted from Linux Questions It worked in both. Thanks for your time and the patch.